ESS Shakuhachi Forum :: urushi or another type of lacquer? urushi or another type of lacquer? Posted: 2015-05-20, 18:26 Post subject: urushi or another type of lacquer? I have an old "Franken-hachi" with the root added to a Japanese Madake bamboo pole. The root appears to be pawlonia or another very light wood. The root is coated in black. It is either urushi or an ancient oil-based marine lacquer. Quite thick and impervious. I notice that in a couple of places that the coating is wrinkled. Might this be indicative of an oil-based marine (or other synthetic lacquer) or does urushi wrinkle as well? Posted: 2015-05-21, 11:50 Post subject: urushi or another type of lacquer? Yes urushi does wrinkle. Especially when the coat is (too) thick and the freshly lacquered object is placed in a (too) humid curing place right after application. Black is black, but transparent or colored urushi also darkens more when cured quickly. Posted: 2015-05-24, 02:09 Post subject: urushi or another type of lacquer? Thank you, Kees. So it probably is urushi as I've never seen an artificial lacquer with quite the character of this example. 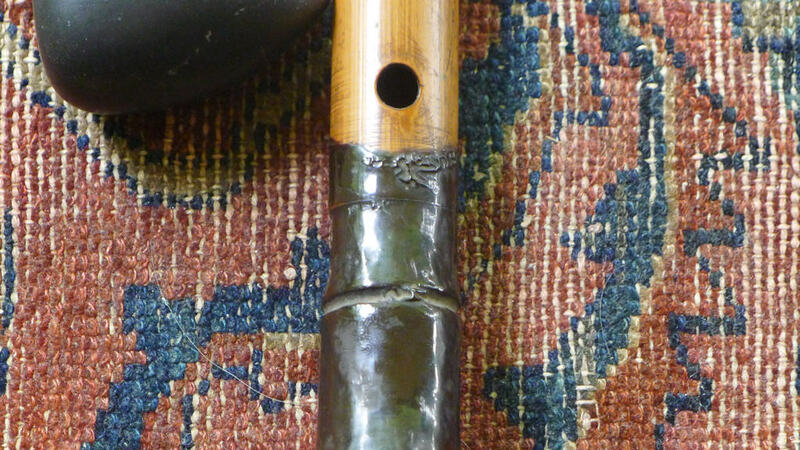 It looks like the "Franken-root" was dipped in very thick urushi. Posted: Today at 14:41 Post subject: urushi or another type of lacquer?